It’s autumn, and officially Pumpkin season! You see pumpkins everywhere, and by every where I mean literallyyyyyy EVERYWHERE. From gardens, to farms, to markets, to store aisles, and even your phones. Yesss!!!! you open anything online , and there pops a pumpkin. When there is so much of Pumpkin, how can you miss making pumpkin recipes. These are fresh, ripe, big and and everything foods and the beauty of autumn, demands for everything pumpkin. 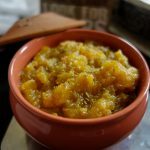 It is one of the fruits , the recipes of which can be twisted to be sweet or savoury.Every time I see a pumpkin, I am reminded of pumpkin halwa/pudding, that I sooo loved when I was a kid, and its still one of my favourite halwa’s. In India, pumpkins are a regular part of diet in autumn, and having pumpkin in the form on vegetable, raitas, paranthas is so common, in most of the households.Also, pumpkin is one fruit/ vegetable that can be had during the navratri fasts, and pumpkin halwa is one of the treats that is often cooked during navratris. Check out my pumpkin raita and pumpkin parantha recipes, already on the blog . 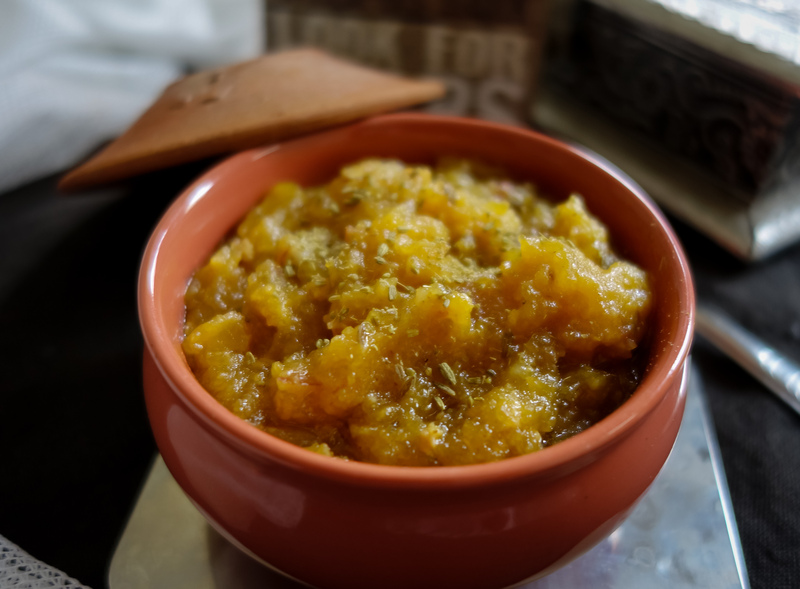 Pumpkin halwa/ pudding recipe is below. This is very easy to cook, healthy and delicious as well. Check the detailed steps, and various options to add different flavours to it. Hopefully you will enjoy cooking and eating this. For the pumpkin halwa/ pudding recipe, you literally need no ingredient other than pumpkin and sugar!!! All other ingredients are optional. 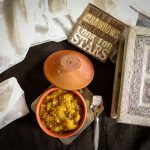 My mum always adds fennel seeds, and I really like the subtle taste of fennel seeds in this halwa, but this can be skipped if you do not have fennel seeds, or if you are making these specifically for navratri fasts.You can add other optional nuts and seeds, as I have mentioned below. I follow my mums recipe, and cook this in ghee, but you can use any oil of your choice. Personally I prefer the taste of ghee in Indian treats, as it imparts a real nice aroma and flavour to any halwa. This halwa , does not need much of liquid, as pumpkin when cooked leaves a lot of water, which is enough to cook it. 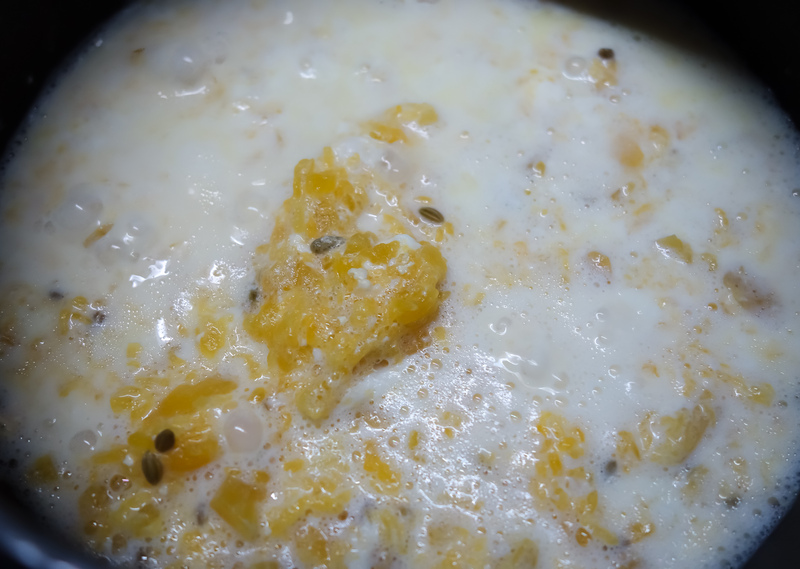 But sometimes when the pumpkin is not very ripe, you can add a little water while cooking, or another option is adding a little milk and cream (or just milk) to make it creamier.In this recipe, I use milk and cream. I do not add any nuts to my halwa, as my daughter would not eat the halwa with nuts. But you can roast chopped almonds, cashews, raisins (all of these or any of these) with a little ghee/oil and add it to the halwa. It adds a nice texture and taste to the halwa. Also you can add melon seeds, if you do no want to add other nuts.Melon seeds go really well with pumpkin flavour. You can make this in a pan , or cooker. Its quicker in cooker, as pumpkin takes less time to cook. 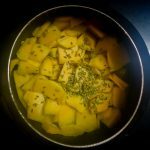 If Cooking in a pan, Add the pumpkin and fennel seeds, cover and let cook for some time on slow heat. Once the pumpkin starts leaving water, add some more water, and cook till the pumpkin is tender. Peel and cut pumpkin slices , into cube size pieces. Wash them, and add to the pressure cooker. Add fennel seeds. Pressure cook this for 2-3 whistles. Check if it is done, pumpkin should be tender, and mashable. If not done, add a little water and pressure cook again for 2-3 whistles. If adding milk– Once done, open and add a little milk and clotted cream (optional), and cook it on slow heat till the milk is completely dissolved, Keep stirring in between. Once done mash the pumpkin with the back of the spoon.If you are not adding milk, skip this step and proceed to the next. Mash the pumpkin with the back of the spoon, and let it cook on slow heat till it is completely cooked, and it forms a kind of rough puree. If you are adding nuts- In a separate pan heat a little ghee, and roast the nuts for 2-3 minutes in ghee, and add the cooked pumpkin. If you are not adding nuts- then add ghee at this stage in the cooked pumpkin, and stir well. Lastly ,Add sugar , Stir well, so all the sugar is dissolved. Your pumpkin halwa is ready to be served. You can garnish it with more nuts, or just with some roughly crushed fennel seeds, and serve it as a dessert! 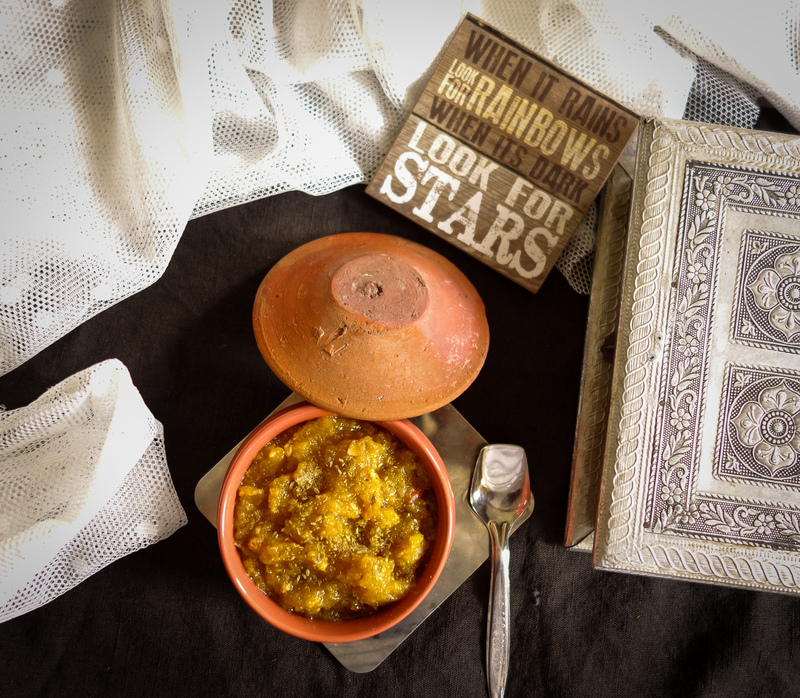 Other sweet recipes here- Suji Halwa and orange jelly pots. Peel and cut pumpkin slices , into cube size pieces. Wash them, and add to the pressure cooker. Add some whole fennel seeds. Pressure cook it for 2-3 whistles. Check if it is done, pumpkin should be tender, and mashable. If not done, add a little water and pressure cook again for 2-3 whistles. Once done, open the cooker and add milk and clotted cream (optional), and cook it on slow heat till the milk is completely absorbed. Once done mash the pumpkin with the back of the spoon and let it cook on slow heat till it is completely cooked, and forms a rough puree. If you are not adding nuts-then add ghee at this stage in the cooked pumpkin, and stir well. 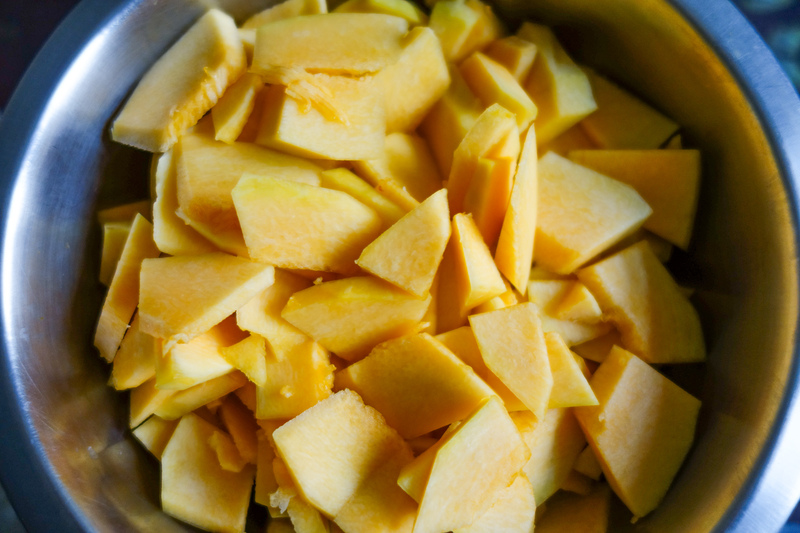 If adding melon seeds-Add ghee and melon seeds to the cooked pumpkin. Lastly ,add sugar , Stir well, so all the sugar is dissolved, and halwa is nice and glossy. Your pumpkin halwa is ready to be served. You can garnish it with more nuts, or just with some roughly crushed fennel seeds, and serve it as a dessert! If you are not adding nuts-then add ghee at the stage, when pumpkin is cooked, and mashed , and stir well. 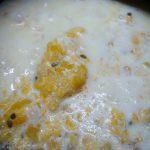 If adding melon seeds-Add melon seeds to the cooked pumpkin, when adding ghee. 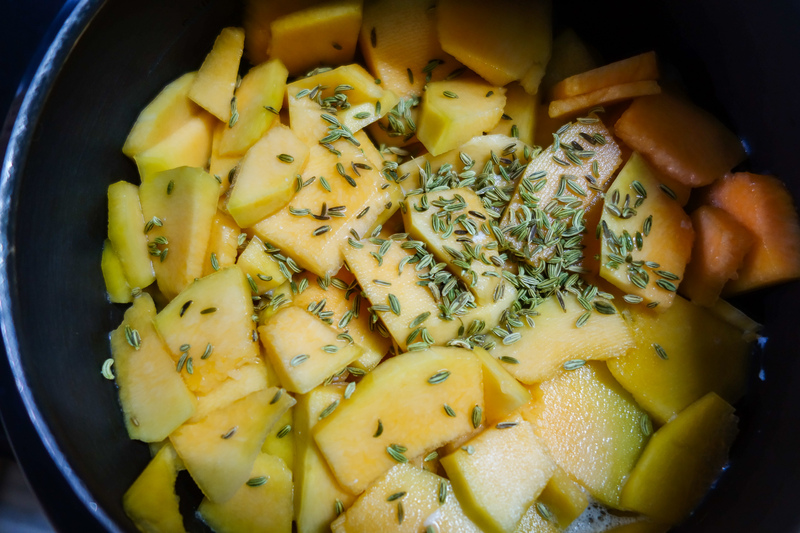 If Cooking in a pan , not in a cooker, Add the pumpkin and fennel seeds, cover and let cook for some time on slow heat. Once the pumpkin starts leaving water, add some more water, and cook till the pumpkin is tender. You can skip adding fennel seeds, if you do not want to. You can skip adding any milk or cream, and instead just cook the pumpkin in water, and add rest of the ingredients.